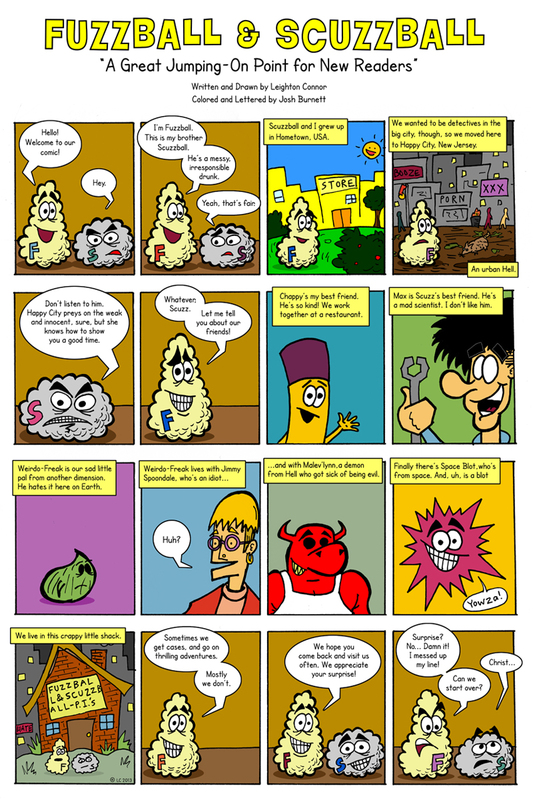 When I drew this comic strip back in 2005, it was going to be Fuzzball & Scuzzball episode #200. That's why it's 16 panels long; I wanted it to be special. I also, as I may have mentioned, wanted it to be a great jumping-on point for new readers. So the strip was drawn and all I had to do was letter and color it, but then some things happened in my life, and it turned out that I don't like to do computer lettering, and I never finished this strip. Never . . . until now! Actually, I didn't finish it. If I didn't have the motivation in 2005, why would I in 2013? But I realized that I could ask someone else to letter and color it for me, and my friend Josh Burnett stepped up to the plate. I'm thrilled with the work he did, and I'm thrilled that, at long last, this comic is out in the world. Next week: Another comic that the world has never seen! I feel just like a new reading again! It's like hymenorrhaphy... for your BRAIN.